If there ever was a verse that exemplified Jalen Mosely, this is it. This young man is one of our regular afternoon volunteers and believe it or not, he is still in high school! The first day that he showed up, stating that he was here for community service, I mistakenly thought he was here because he was court ordered. Boy, was I wrong! 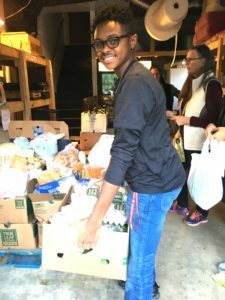 Jalen was willingly and wanting to help in any way that he could, in order to show his potential college educators that he has a heart for service. In an age where after school hours lend to Xbox or Netflix marathons or worse, Jalen chooses to use his free time serving others. Jalen is always smiling or laughing and will tell you himself that one of the things he loves the most about Grace Klein is that “whether they are new to GKC or come regularly, everybody leaves with a smile on their face.” He also says that “GKC not only opened his eyes to people in need, but it also gave him the opportunity to get involved with a community that really cares about each other.” On any given day, Jalen can be found breaking down boxes, sorting cans… or what brings a smile to his face the quickest, helping someone to their car with their food. I asked Jalen what he’s learned the most during his time here at Grace Klein and he said, “well, when I first came to GKC, I thought that you didn’t have much help. But the more I came, the more I saw that there were more and more people that would come and pitch in. It was amazing to me to see how God brings people together to help each other out. I also know without a shadow of a doubt that God put me on this earth to help others and volunteering here opened my eyes to that. I am very glad that I have been able to help others who are less fortunate.” Well Jalen, we are glad too! How good indeed it is when we all work together! We can all learn from Jalen that you are never too young to set an example or make a difference with our lives. What started out as a few hours of his free time, has paved the way for a life, now known, as servanthood. What do you have in your hand? Could it be, like Jalen? Taking that first step towards your destiny begins with a “yes, I will!” Thank you, Jalen, for teaching us that age truly is… just a number.